After the chilly quiet that is January, the awakening of nature that begins to happen in February is a welcomed sign. Although still seated deeply in the heart of Winter, February marks the beginning of the seasonal passage into spring, as the days begin to get noticeably longer, and life begins to stir from its wintery slumber. People have noted and marked this transition for centuries, celebrating as early flowers, sprouting trees, and stirring animals heralded the passing of Winter. 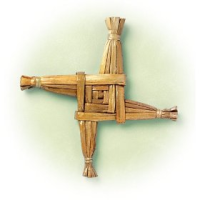 The first old, traditional holiday of the new year, Imbolc, is a Gaelic festival that honors Saint Bridhid and marks the beginning of Spring in Celtic tradition. It is usually celebrated on Feb 1-2, a cross quarter day midway between the Winter Solstic and the Spring Equinox. For Wiccan’s, Imbolc is a Sabbat day, one of the eight celebrated holidays of the year, which focuses on the Goddess Brighid. Celtic pagans honor Bridig from both Celtic religion and Irish mythology who was the daughter of the “all father” Daghdha. For Catholics, Feb 2nd is more commonly known as Candlemas, a day of blessing, usually of candles that will be used through out the year. Some also know it as the Presentation of Jesus at the Temple, a holiday that symbolizes the practice of “Churching”, or blessing woman 40 days after child birth (Feb 2 is 40 days after Christmas). This parallels the old Celtic belief that Imbolc marked the recovery of the Goddess from giving birth to the God (the sun), symbolized by the growing days; as well as the common tradition of lighting every candle in the house at sunset on Feb 2nd to honor the sun’s rebirth. And of course, to the vast majority of people long sick of the wintery weather, it’s Groundhog’s Day. A day that pulls roots from both Celtic and Germanic backgrounds. In Great Britain, the weather on February 2nd was believed to foretell the weather of the coming year, especially where winter is concerned. Old German traditions told of a badger or a bear that would foretell the fate of Winter, the tradition being carried to the US by the Pennsylvania Dutch. Of course, as we all know, the badger and bear have been replaced by a nobler species of critter. However, since studies show that Punxsutawney Phil’s forecasting accuracy is only 39%, perhaps it’s time to pick another animal. 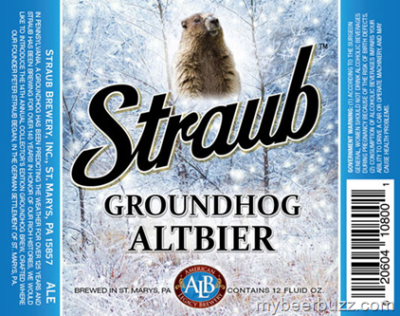 Straub Brewing in Saint Marys, PA salutes the groundhog. If January is a month for looking forward, February is a month for looking at the now to make sure one is prepared for the rush of activity that will no doubt arise from the coming of warmer days. It’s a great time take stock of what you have and prepare for the coming months. Homebrewers can use this time to see what ingredients they have and compare with what they’ll need for planned future batches. Barbequers can take stock of spices, replacing those that have been used or have gone stale (don’t be afraid to chuck that container of cayenne that you and your fiancé bought. Speaking of which, how was your 10th wedding anniversary? ), and check on how much charcoal and wood is left over from the previous season. Bloggers, when was the last time you went into your dreaded “drafts folder” or ran down your blog roll? As with all months, the February moon goes by many names; Snow, Ice, Storm – all obviously appropriate for those of us who live in areas where Winter is really taking her toll this season. But it’s also known as the Quickening Moon. “Quickening” is a word that refers to when a pregnant woman first starts to feel fetal movements, which makes it the perfect name for the full moon that marks the beginning of longer days, in a month that celebrates the awakening, or rebirth, of nature. For me, the beer season is waking. After several quiet months, with no major events or festivals, Presidents Day weekend starts it off with a trip to Max’s Taphouse in Baltimore for their annual Belgian Beer Festival (in fact depending on when you read this, I might be sitting there now). And then a week later, Kennett Brewfest will host their second annual Winterfest. And before you know it (seriously before you know it) Spring beers will be appearing on the shelves replacing the darker, stronger beers of Winter, restarting the whole seasonal brewing cycle anew. Throughout many Religions and beliefs in the world, through different festivals and observances, February marks and celebrates the rebirth of nature and the renewed cycle of life. And one could make a case that it does the same for the craft beer world as well. At least for me. 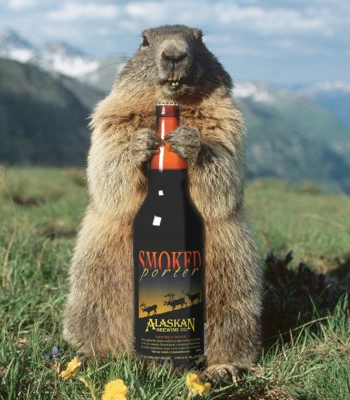 The Final Sip: Due to the small presence of true groundhogs in their State, Alaskans celebrate Marmot Day on February 2nd. That settles it. I’m pouring my 2007 Alaskan Smoked porter in honor of a belated Marmots Day! I don’t know how you’ve managed to keep a bottle of ASP around for that long, but I hope it rocks. Definitely a beer I wish we could get here in Delaware. Love the structure of this! My spring is always judged by a new purchase of running shoes. I can’t run outside during the cold months and usually by April. It’s time to get back outside. I figure I’ve got a few weeks left before my annual purchase, so it’s a nice reminder what’s around the corner. Nice. I’m not a runner, but I can definitely see how that is a big sign of warmer weather for you. I guess everyone probably has one.